This is the 2nd of the Homer Price books by Robert McCloskey. 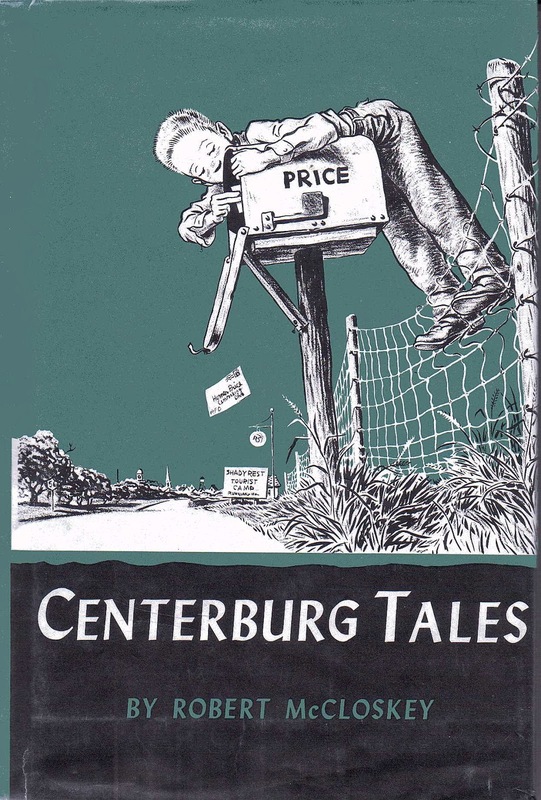 The book opens in Centerburg, the town which sits just a couple of miles from Homer’s home at the intersection of two highways. Mr. McCloskey has a way of getting right to the heart of the matter when it comes to children’s things, and he starts off with a chapter called "The Hide –A-Ride". The kids in town all know and love Grandpa Hercules; whom they call Uncle Herc for short; and he is a big part of their lives as they go about their daily lives. He spins stories while they spin tops, and he manages to infuse all of his tales; true or not; with a bit of local history. In this chapter he spins an unlikely, though wonderful tale about a ride he helped to build for the Indian natives way back when. That endeavor involved a barrel rolling down hill, which had an intoxicating effect on the Indians, but was bad for the barrels. So, Grandpa Herc invented the Hide-A Ride, which was a mechanized way for the barrel to be spun without destroying it each time. It’s kind of a Rube Goldberg contraption, with a wonderful illustration by the author for the more unimaginative. This story would probably be politically incorrect by today’s standard, illustrating just how “enlightened”; or thin skinned; we have become. Grandpa Herc has had many experiences, all of which he eagerly shares with the kids of Centerburg. Like the time he went hunting for gold in California. His adventures there with Hopper McThud are so enthralling that at one point Grandpa has the crowd so mesmerized that they are all looking at the luncheonette ceiling as he describes a cliff hundreds of feet in the air. This guy is some story teller! One day Grandpa gets a package from Gravity-Bitties, a breakfast food for champion jumpers. This cereal is so potent that it comes with a chunk of lead to put inside your coat to keep you from jumping too far. But Grandpa is wiser than all of the advertisements and proves his wisdom by not eating the Gravity-Bitties and jumping far anyway. His point was proving that the advertising people don’t know what they are talking about. Heck, he fed the cereal to the chickens! From Homers experiments at home to the goings on at the barbershop, these stories are emblematic of what life was like in the years after the Second World War. In so many ways we were at the acme of our strength and influence as a nation. Socially there were still kinks to be worked out in the areas of Civil Rights and poverty, but for the most part these was the best of times. And in Robert McCloskey’s books about Homer Price those times are palpable.